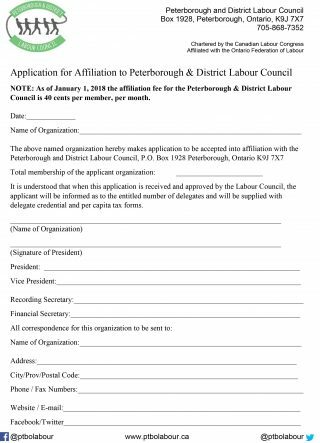 Whereas local Unions, branches, and lodges of national and international unions that are otherwise eligible to join the PDLC are ineligible for associate membership. Now, Therefore, the PDLC sets out the following procedures for admission as an associate member and the rights and obligations pertaining to such membership. 2. The Secretary will forward these materials to the rest of the Executive for consideration. 3. The Executive can choose to recommend the organization for associate membership, may decline to forward a recommendation, or may request additional information before making a decision. 4. If the Executive chooses to recommend the organization for affiliate membership, it must present the application along with its recommendation to the general membership which can approve the organization’s application with a simple majority vote, provided that quorum for the meeting has been met. 5. The organization may begin attending PDLC meetings and otherwise participating in the life of the PDLC following receipt of membership fees according to the following scales. Fees shall be paid annually, in advance, and are non refundable. 6. Associate members are encouraged to designate one, or more, PDLC Visitors for their organization and these individuals will serve as the primary point of contact between the PDLC and the associate member. 7. PDLC Visitors may attend PDLC meeting with voice, but not vote, provided the associate member is not more than three months in arrears with its dues payment. Visitors are ineligible to stand for elected office, but may serve on PDLC committees, working groups, and other such bodies. 8. PDLC Visitors will be added to PDLC contact lists. 9. PDLC Visitors will be expected to conduct themselves in PDLC meetings in a manner consistent with the PDLC By-Laws, the Policy of the organization, and the Rules of Order then in force. G.U.S., Havelock IGA, Minute Maid, Morello’s Independent Grocer, United Canadian Malt.